After theorising last month that it would be unlikely for the government to make any ETS announcements before the election, we received an announcement! This announcement effectively signals the strategic direction the ETS will take, and shows that future changes will likely be well signalled. It seems that the objective will be to benchmark New Zealand’s carbon market with others around the world, while protecting the integrity of our ETS. There is likely to be 12 – 18 months of consultation before any changes come into effect, and long-awaited information on changes to forestry accounting and operational improvements may not be available until 2018. The full press release can be found here. Meanwhile, the NZ Productivity Commission has published an issues paper for its inquiry into transitioning to a low emissions economy. The purpose of the issues paper is to assist individuals and organisations to participate in the inquiry. It outlines the background to the inquiry, the Commission’s intended approach, and the matters about which the Commission is seeking comment and information. The paper contains specific questions to which responses are invited. Submissions are due by 2nd October 2017. The inquiry will identify options for how New Zealand could reduce its domestic greenhouse gas emissions and transition towards a low emissions future, while continuing to grow incomes and wellbeing. More information can be found here. 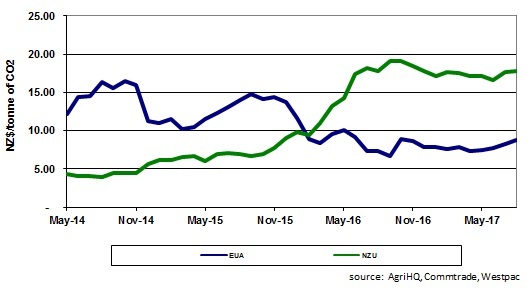 NZU trading has remained in a pretty tight range for the past month, around the $17.75 mark. A short-term dip towards the end of July saw trading around $17.50. Pricing has remained healthy into August, with trades reaching the $18.00 mark on 17th August. European markets continue to show gains, with EUA prices moving up for the fourth month in a row.